Gah! my apologies for the 10-day hiatus! I haven't had the chance to blog about anything last week since my brother borrowed my Canon (point & shoot) Camera. I use that particular camera whenever I take swatches of products since it is lightweight and easy to use. I always have a hard time taking swatches using my DSLR camera because it's too heavy to take a steady shot with just one hand. 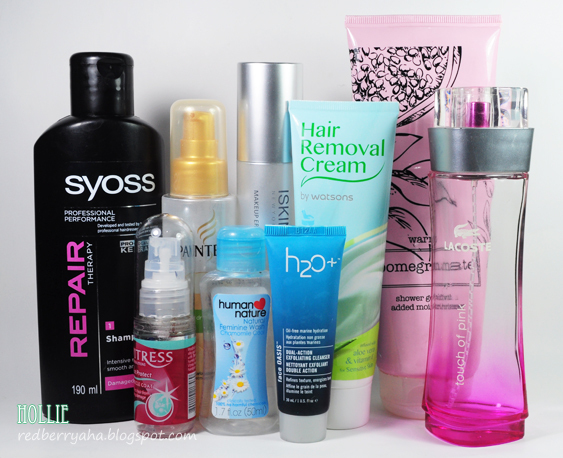 Anyway, I'm back and happy to share with you some products that I emptied for the past few months. I had another batch of empties earlier this year but I decided to skip blogging about it since most of the products from that batch are items that I already talked about. I know these are just basic hair and body products, but I though you might be interested to know what I've been using at the moment. Watsons Hair Removal Cream for Sensitive Skin - the tube says it contains Aloe vera and Vitamin E. This is actually my second tube and it's pretty good, to be honest. It really works and it's affordable too. It also comes with it's own unique plastic spatula thingy, which I use to apply the cream on my legs and remove them after a good 15 minutes. This big tube is regularly priced at 199, but I got it for Php150 during their sale last spring. 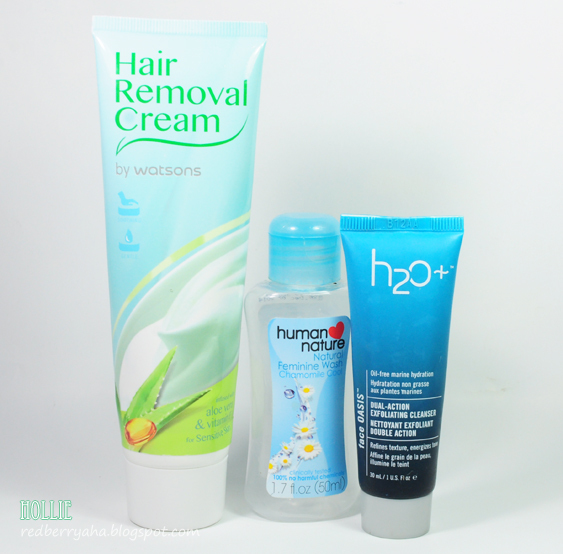 I use the hair removal cream on both my legs and the tube can last for 2 - 3 uses depending on your leg size. This also comes in a smaller tube priced at Php 99 only. Human Nature Natural Feminine Wash in Chamomile Cool - This is my all time favorite feminine wash. It really does relieve itchiness and keeps me feeling fresh all day. This 50ml bottle can last for up to 3 months, depending on usage. (this is actually my 5th bottle of this variant) The best part is, it's super affordable at Php 54.75 only. 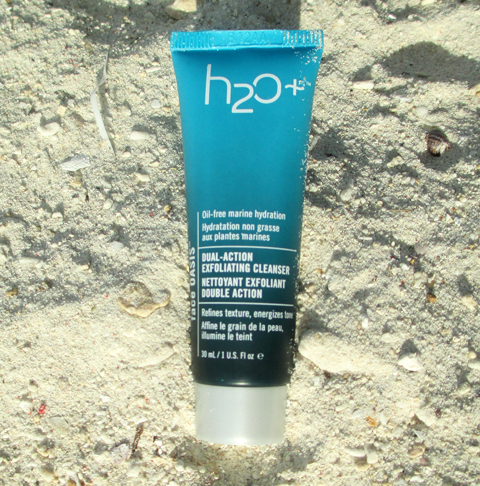 H2O Plus Face Oasis Dual-Action Exfoliation Cleanser - the tube says, it refines texture and energizes tone. I got this product from my Sample Room Holiday Goodie Bag. It costs Php1,750 for 120ml at the SM Beauty Section. I've been using this 30ml sample tube day and night for almost 4 months, and I have to say, it does what it is supposed to do. I'm even surprised that this tiny tube lasted this long. I only need a pea-sized amount of this product to wash my entire face and neck. It smells nice, similar to that of mild ocean scents. It lathers really well and also contains tiny beads that melts while I massage it on my face. I actually really like this cleanser, since it leaves my face feeling smooth and well hydrated. I would have bought this cleanser, if only it wasn't so expensive. Marks & Spencer Warm Pomegranate Shower Gel - (the pink tube in the first photo) It's just a regular shower gel that smells like pomegranate. It's not as moisturizing as the other ones I've tried before, but doesn't leave my skin feeling dry at all. I got this as a Christmas present from my best friend last December, so I don't know how much this cost. 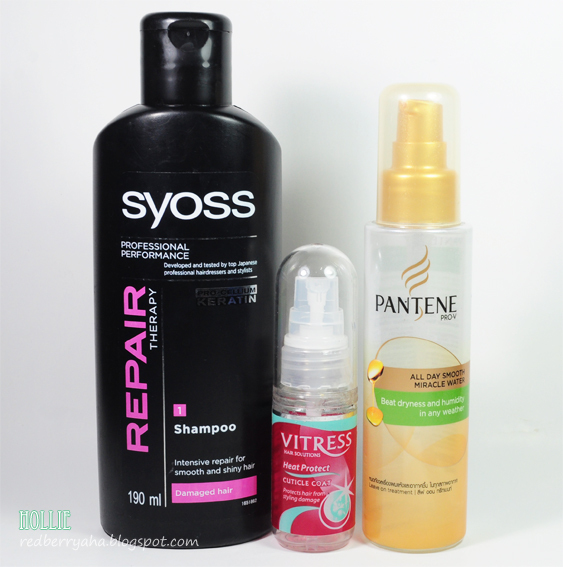 Syoss Repair Therapy Shampoo - this 190ml bottle cost around Php85 pesos only. It says, Intensive repair for smooth and shiny hair. It's my second time using this shampoo, it helped my hair feel soft and smooth. I didn't notice if it made my hair shiny though, but I think the Keratin content helped revived my dry and frizzy hair. I also don't feel the need to use a conditioner every time I use this shampoo. It's not bad all considering the affordable price. Pantene All Day Smooth Miracle Water - This is actually my second bottle already and overall, I like it. It's an awesome product, especially if you don't like sticky creams or oils since this is water-based. I apply about three pumps of this product while my hair is still damp. It helps my hair become less frizzy. When my hair dries, it looks healthier, it feels softer and smoother but not shiny. If you just want a hair product that helps tame your hair without looking greasy, this would be it. 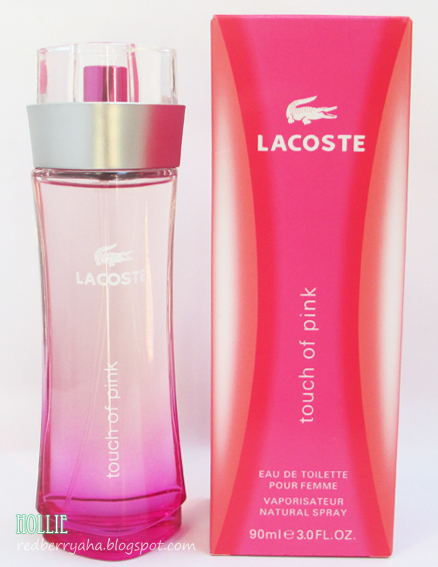 Lacoste Touch of Pink perfume - I received this as a Christmas present from one of my girl friends, last December 2013. This isn't a typical scent that I'd enjoy, but it's not bad at all. It is not overpowering like I thought it would be, it actually smells fresh, sporty and feminine, but a little sharp on the first spray. This is what it looks like when I first got it last December. I can easily the smell the combination of citrus and powdery scent of this perfume. Based on Fragrantica.com the Top Notes include Orange, Peach and Cardamon. Middle Notes include Jasmine, Violet leaf and Coriander. Base Notes include Vanilla, Musk and Sandalwood. Have you ladies tried any of these products? what do you think of them? woah! those things that you have mentioned on your blog are accurate and true. keep it up!